You can create or edit a default email signature for all emails you send from SalesforceIQ, or enter a custom signature for a specific message you are sending. Note: For any of the methods described below, you can customize your signature with formatting options such as bold, italics, various fonts, sizes, and more. The formatting options appear at the bottom of the signature screen. Click at the top of any screen. In the left navigation panel, click Email Signature. Enter a default email signature for all emails you send from SalesforceIQ, or edit the existing default signature. In the left navigation panel, click Compose Email. 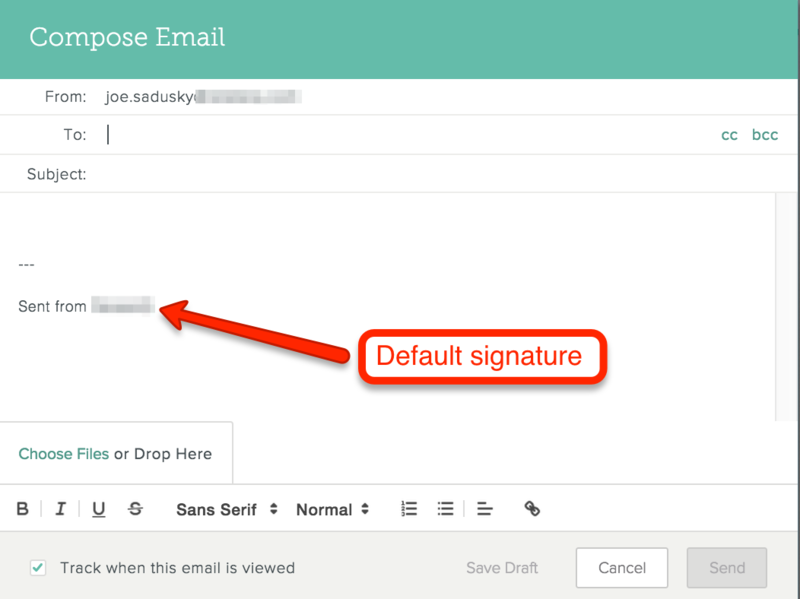 Edit the default signature that appears in the message entry form. Note: Any changes you make to the signature here apply to this message only, not to any other emails you send. Click Send or Save Draft. You can link to an online image to use it in your email signature. The image must be from a publicly available URL. For example, to use your company logo, do a web search to find a public version of the logo, and then link to that URL. Click in the row of formatting options. Enter the public URL for the image and click Insert. This article explains the support SalesforceIQ offers for customers who use an email alias. Registering for SalesforceIQ—You can use an email alias when you register for SalesforceIQ. However, when you connect your Gmail account during the sign-up process, you must pick a main Gmail account. The process displays main accounts only. Incoming messages—You can receive messages sent to an email alias as long as the alias directs to the main connected Gmail account. Outgoing messages—Currently, you can't send a message from an email alias in SalesforceIQ. This includes composing, replying to, or forwarding a message. Stream—All messages and calendar events sent to an email alias appear in your Stream, as long as the alias directs to the main connected Gmail account. SalesforceIQ doesn't support the use of email aliases with Exchange and Office 365 accounts at this time. This includes registering with SalesforceIQ, receiving messages, and sending messages.